Spotless Results is a family owned company. From the very beginning it was part of the business plan to give back to the community that has supported them so generously and graciously. 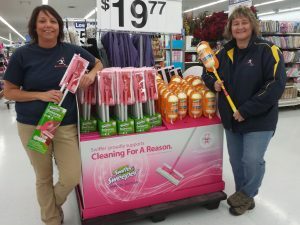 The only question was how...and the answer is "Cleaning for a Reason"
Partnering with “Cleaning for a Reason” allows Spotless Results to fulfill our desire to give back to a community that has been so very generous to us. Cancer not only affects the women who are fighting it, but it affects their entire family, which is why this partnership makes perfect sense. We feel strongly that “home is where the heart is” and we want to help foster a sense of peace during their difficult journey. It is our hope that cleaning their home will lighten any overwhelming feelings, and allow them to feel a little bit more at peace. Apply for services by clicking here.